Woorndoo shearer Roger Mifsud, left, and his son Corey Mifsud in action in the shearathon. Photo – Kristy Crawley. 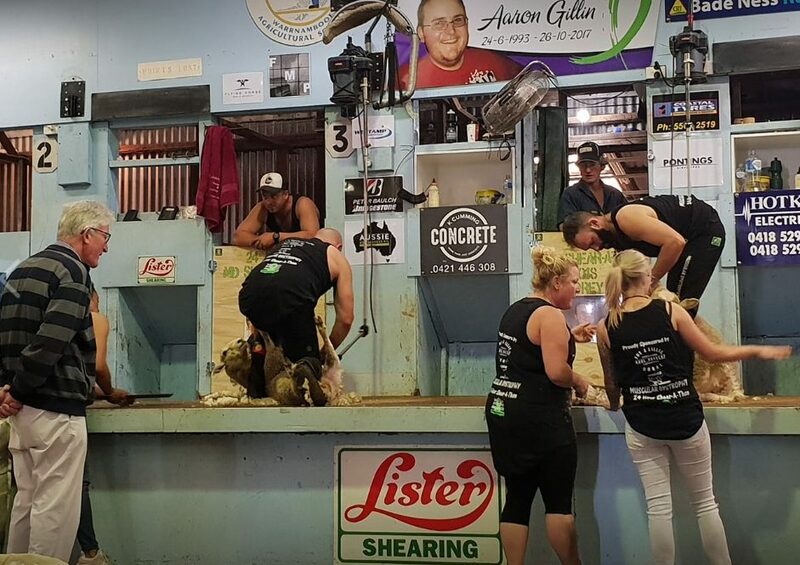 WOORNDOO shearers Roger Mifsud and his son Corey have raised thousands of dollars to fund a family’s fight against muscular dystrophy in a 24-hour shear-a-thon in the south-west Victorian city over the weekend. Roger, 52, and Corey, 30, shore 1542 lambs in 24 hours, spending about 19.5 hours on the handpiece, starting from 5pm last Friday at the Warrnambool showgrounds. A final tally of proceeds has not been calculated, but money raised from the shear-a-thon and gold coin donations from spectators of the event will go toward supporting the Gillin family of Warrnambool, which recently lost son Aaron, to Duchenne muscular dystrophy. DMD is a genetic disorder characterized by progressive muscle degeneration and weakness. Aaron’s brother Chris also suffers from the disease and attended the event with his parents Ash and Mandy. The two shearers initially worked for six hours straight with Roger setting a pace of 40 lambs per hour and Corey not far behind. Their initial target tally was 1500 lambs. Recovering today at home, Roger said the event was originally meant to be an opportunity for Corey to “have a crack” at his father’s previous tally of 636 sheep in 20 hours. Roger shore 787 lambs and Corey managed 755 in the shear-a-thon. “We’ve known the Gillins a long time and to do it for that cause was terrific. Roger was proud of his son’s effort and said there was a big team behind the effort, including wool handlers Roger’s partner Jo Mackey, and Fluff Tonkin, who lost a brother to the disease. The sheep were delivered to Warrnambool from Mortlake by Hodges Livestock Transport. Roger said there were also a lot of other family members and friends, out the back keeping the sheep up, washing their clothes and providing food and drinks for the event.